Surrogates: Remember back in 1995, when suddenly we had all those five-minutes-into-the-future, virtual-reality-will-doom-us-all movies like Virtuosity and Johnny Mneumonic and Strange Days? 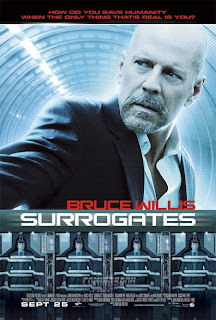 Surrogates looks like it was supposed to come out that summer too. Capitalism- A Love Story: I'll be part of the choir that Moore is preaching to. Look for my review later in the weekend. Brief Interviews with Hideous Men: John Krasinski (Jim from The Office) writes and directs this adaptation of David Foster Wallace's novel. I'm expecting that it'll be pretty good, provided it's not a whole movie of people doing bemused reaction takes, straight into the camera. Coco Before Chanel: I sure do like Audrey Tautou, but this period biopic looks like a snoozer to me. That said, I may not be the target audience.